Desde el día de ayer el link que lleva a mi encuesta no funciona, los usuarios que han intentado ingresar me reportan un problema donde aparece que la página no se encuentra. 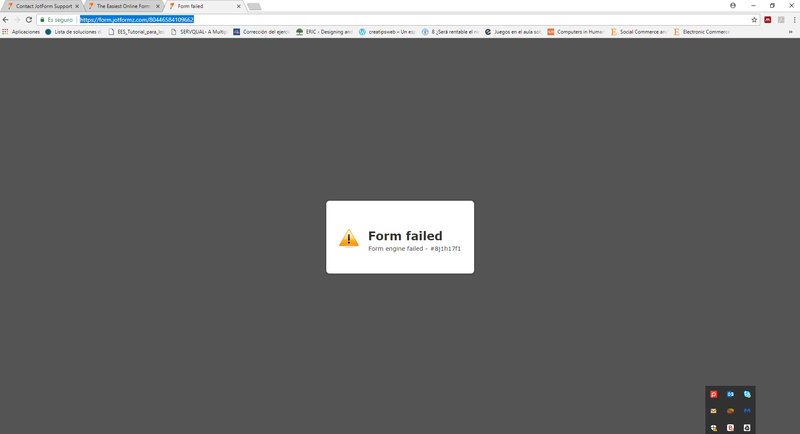 I checked your form and I was able to replicate the same error on my end. I have raised this issue with our backend team for further checking. We will update you on this thread once we have any updates. I hope i could be son, because this is an inscription format for an event that I’m planning and the users can’t make de inscription without this. Enviado el: jueves, 5 de abril de 2018 12:50 p. m.
I checked your form and I was able to replicate the same error on my end. I will raise this issue to our backend team for further checking. We will update you on this thread once we have any updates. I have solved the problem and updated your form. It seems that the problem is resolved. Can you check and let us know if it is working correctly on your end, too?